Whether you are developing software, writing articles, or doing something else, a decent project management and time tracking application can help make your daily computing less stressful and your business more efficient. In this article, we take a look at two such tools: Collabtive and Kimai. Collabtive  is a relatively new project, but it already shows a lot of promise. The Collabtive MySQL/PHP-based project management solution is ideal for workgroups and individual users who are looking for a light-weight tool that is accessible via a web browser. Collabtive offers most of the features essential for efficient project management wrapped into a slick AJAX-ified interface. Installing Collabtive is an absolute breeze. All you do is download the latest version of Collabtive, unpack, rename the resulting directory to collabtive, and upload it to your server. You might also need to create a MySQL database for use with Collabtive. To do so, point your browser to http://yourserver/collabtive/install.php and run the simple two-step installation procedure. After logging into Collabtive, you are ready to go. First you might want to change the default German language and edit your user account details. To do this, click on the My Account icon and press the Edit button. Here, you can enter your email and address info, choose a picture, select the desired interface language, and change your password. Next stop is the Administration section; this is where you add new projects, manage users, and tweak Collabtive's global settings. To create a new project, press the Add project button, give your project a name, enter a description, and assign it to one or several users by ticking the appropriate checkboxes (Figure 1). Adding new users to Collabtive is equally easy: Click on the User administration icon, press the Add user button, and fill out the required fields. Here, you can also add the new user to one or several existing projects. Figure 1: Creating a new project. For each project, Collabtive allows you to create milestones and add task lists to them. Here's a practical example illustrating how this system works in practice. 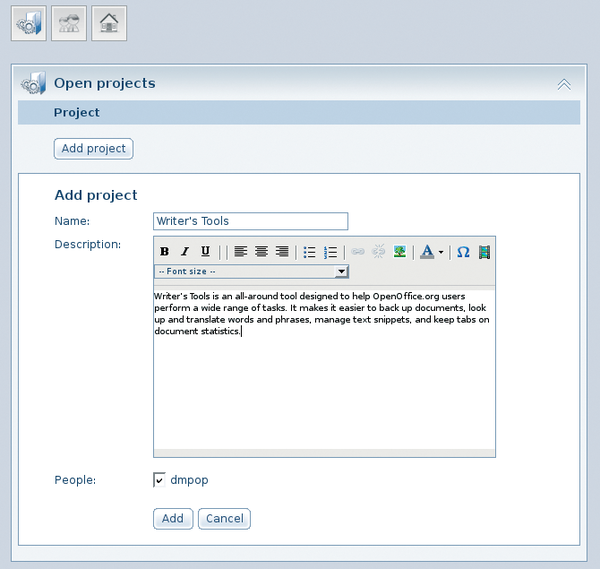 In my spare time, I develop the Writer's Tools OpenOffice.org extension. To keep tabs on my work, I created the WriterTools project in Collabtive and added a milestone for each release of the extension – for example, WriterTools 0.9.5, WriterTools 0.9.6, WriterTools 0.9.7, and so on. For each milestone, I created a task list containing tasks for the particular release. Because Collabtive allows you to attach multiple task lists to a milestone, I created two separate lists: one for new features and another for the bugs that must be fixed. This nifty feature helps to group tasks to keep better track of them. 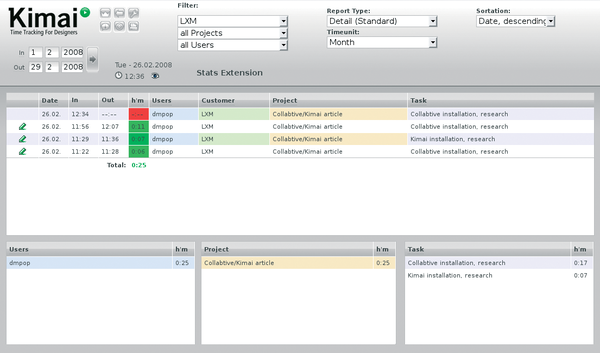 To manage milestones and tasks as well as other project-related stuff, Collabtive offers the Dashboard view (Figure 2). To access the Dashboard, click on the project you want in the My Account or Desktop section. The Dashboard provides a quick overview of the project's milestones and project-related activities. The latter is particularly useful in situations in which multiple users are working on the same project. 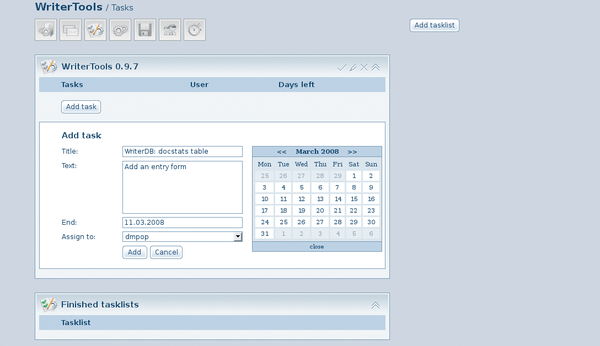 Figure 2: Dashboard gives you a quick overview of a project. Whenever a user adds or modifies a task, attaches a file, or creates a time entry, the action appears in the Activity section. 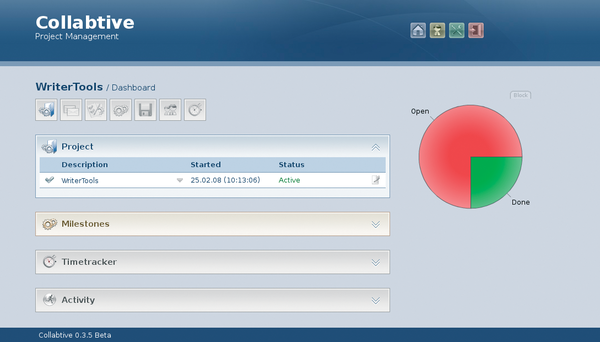 The Dashboard also provides access to other project-related areas. The Milestones area allows you to add milestones to the project. To do this, click on the Milestones icon in the Dashboard, press the Add milestone button, fill out the required fields, and press Add. The created milestone then appears in the Milestones calendar. Adding a task list to a milestone is equally easy. Switch to the Tasks section by clicking on the Tasks icon in the Dashboard, then press the Add tasklist button, and enter a name and description for the new task list (Figure 3). To attach the task list to a particular milestone, select it from the Milestone list. Figure 3: Adding a task to the task list. Once you've created a task list, it is easy to populate it with tasks. When a task in the list is completed, mark it as done by clicking on the Close button, and the system moves the task into the Finished Tasks section. When all the tasks on a given task list are closed, the entire task list is moved into the Finished Tasklists section. To keep track of your workload, you can use the progress meter in the Dashboard. This simple Flash-based applet displays a pie chart of closed and opened tasks. Collabtive also generates an ICS calendar file for each task list, so you can use any iCal-compatible calendaring application to keep track of your tasks. The Files section is designed to store project-related files. Although it doesn't offer any advanced features like version tracking, it can come in handy when you want to share documents and files with other project users (Figure 4). This can be done by posting a message in the Messages section with an attached file. Other users assigned to the project can then read the message, download the file, and post a reply. Figure 4: Messages can have files attached. Collabtive comes with a simple time tracking tool, which can help you to keep tabs on the time you spend on a project (Figure 5). In the current version, the time tracking tool is pretty basic: it allows you to enter a start and end time, and you can then see a list of the created time entries in the Timetracker section. Collabtive also allows you to export the time data as a spreadsheet or a PDF document. The current version of the application supports only the Excel spreadsheet format, but you can open the exported files in OpenOffice.org. 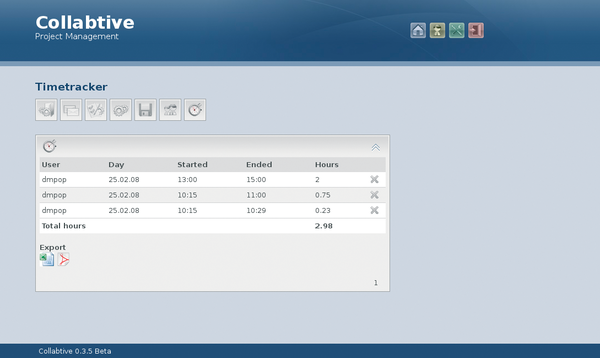 Figure 5: Collabtive features a simple time tracking tool. Collabtive is a relatively new application under heavy development. This means that every new release of the application brings a slew of improvements and new features. Fortunately, the process of updating your current Collabtive installation to a newer version is rather painless. First, download the latest release of Collabtive, unpack it, move the config.php file from your current installation to the new Collabtive folder. Then, replace all files in the collabtive directory on your server with newer files on your desktop, and point your browser to http://yourserver/collabtive/update.php to perform the update. Whereas Collabtive can help you to keep tabs on your projects, Kimai  can take care of tracking the time you spend on a particular job. In fact, if you are, for example, a freelancer paid by the hour, Kimai is probably better suited for your needs because it provides a better way to record and track your time. To install Kimai, download the latest release of the application, unpack the downloaded archive, and rename the resulting folder to kimai. Then, open the conf.php file in the includes directory in a text editor and specify the required MySQL database information. Next, upload the Kimai folder to your server, point your browser to http://yourserver/kimai/, and log in with the default admin user name and password. Kimai couldn't be easier to use. First, you have to add a customer, a project, and task using the appropriate bottom panes (Figure 6). Then, select the project and task you want and press the big green button to start the timer. Figure 6: Kimai at work. The clever part is that you don't have to keep the browser window open: even if you close the browser, Kimai will continue tracking time. When you stop the timer, a new time entry is automatically added to the main window. To edit the entry, press the Pencil icon next to it. In the Edit Entry dialog box, you can also add notes to the entry, which can be useful when you need to provide a more detailed description of the job. To better manage time entries in Kimai, you can limit the displayed entries to a specific time period with the In and Out fields on the top toolbar, and you can also export the time entries as a PDF document by pressing the Print button. Although Kimai is pretty bare-bones, its functionality can be beefed up with extensions. The Friendly Hacks forum on the Kimai website  contains a few extensions created by Kimai users. The Kimai stats extension , for example, adds some reporting features (Figure 7). To install the extension, create the ext directory inside your Kimai installation and copy the unpacked stats folder into it. To view statistics, go to http://yourserver/kimai/ext/stats. Figure 7: Kimai stats extension. Quite a few project management and time tracking tools are available to choose from, but if you're looking for light-weight web-based applications that are easy to install and use, you should give Collabtive and Kimai a try. 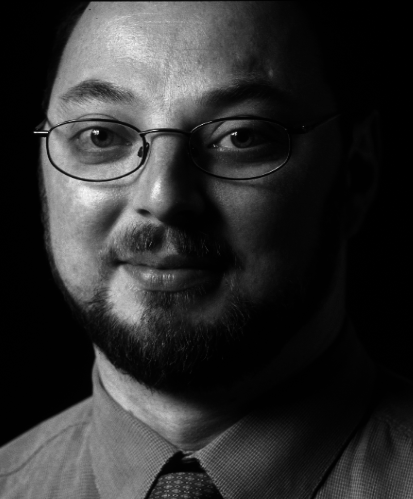 Dmitri Popov holds a degree in Russian language and computer linguistics. He has been working as a technical translator and freelancer contributor for several years. He has published over 500 articles in Danish, British, US, and Russian magazines and websites. Taskjuggler is a handy project management tool for large or small projects. We’ll show you how to organize a simple remodeling job with Taskjuggler. The open source project OpenGoo wants to be the best web office around. Taskwarrior is arguably the most powerful command-line task manager. We show you how to use this application to manage tasks like a pro.